We see no reason at all that commercial fit outs should simply comply with minimum standards. We believe every single commercial fit out should exceed minimum standards. An office fit out above and beyond the minimum standards need not cost a single cent more than one that simply complies with the basics. It’s 7.30am, you are desperate for your morning hit of coffee and you’ve a choice between two local baristas. One asks for your order and your name. They advise the price, take your money and give you your change. They proceed to make the coffee, froth the milk, add the sugar and look absent-mindedly off in the distance with an expression that says. “Only 320 more coffees to make today before I get to go home”. They hand you your coffee and you leave. The next day you visit the barista next door. Firstly they welcome you with a big smile and remember your name from the last time you bought a coffee. Next they ask if you’d like the soy latte with 2 sugars, the same as last week. They take your money, give you your change and punch the first hole in your new loyalty card. Continue to make the coffee, froth the milk, add the sugar, all whilst welcoming other customers as they walk in. They hand you your coffee, wish you a great day and you leave. In both situations, you have received the “minimum standard”. Although the coffees are the same price, both coffees are hot, sweet and made well but the second barista exceeded the minimum basic standards at every stage so you had a far more enjoyable experience for not a cent more. Similarly this exact same analogy can be applied to your office fit out. It is the law that all design and construction companies comply with minimum standards. Most importantly it is the attention to detail as well as the experience, skill and knowledge of your chosen commercial fit out company that will create a more workable, practical and inclusive workspace and one where you and your colleagues, staff, and clients will enjoy. The office fit out for Settlement Services International is a prime example of a project undertaken where the minimum standards were exceeded using our experience and attention to detail and at no additional cost to our client. You can see the details of the project here. don’t simply take our word for it. This is one of the largest office fit out projects SSI has ever undertaken. Apex Executive Interiors guided SSI through the entire process from property search, design, construction and fit out works. 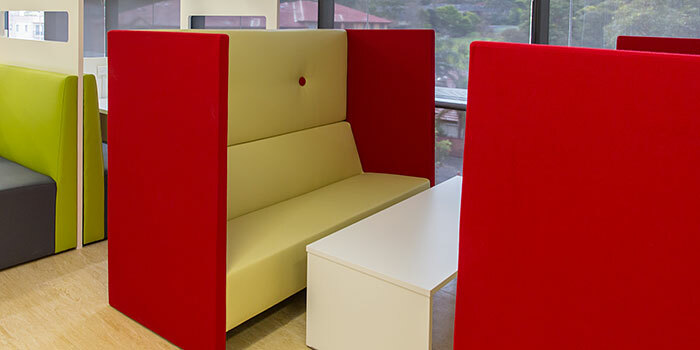 The expertise in office fit out was expected however it was the extra attention to detail in regards to the design of interview rooms and office layout that makes this office fit out uniquely different to any office fit outs previously undertaken. The quality of finishes, service and the delivery is always over and above, this is what makes Apex the preferred office fit out provider for SSI.